"I imagine someone, somewhere in the annals of history, has witnessed this scene first-hand; however, they certainly weren’t likely to survive it and wouldn’t be able to tell anyone about it. But I wanted to relay to you, the viewer, what that someone might have felt. I was able to get a glimpse of it at an annual bison round-up here in Montana. 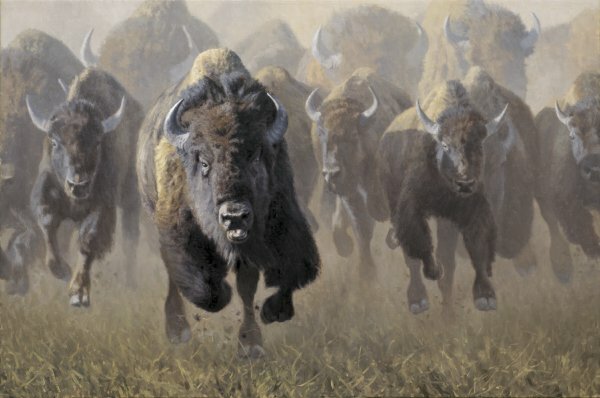 I took some artistic liberties with added dust and arranging the bison as I saw fit for a strong composition, but this is basically what I was able to see from the safety of a ramp, atop the corrals and chutes into which the bison are herded."